This morning, the Skerries Coast Guard team assembled at the Hills Cricket Club, Skerries to prepare the landing site for a visit from the Coast Guard’s Dublin based Sikorsky S92 helicopter. 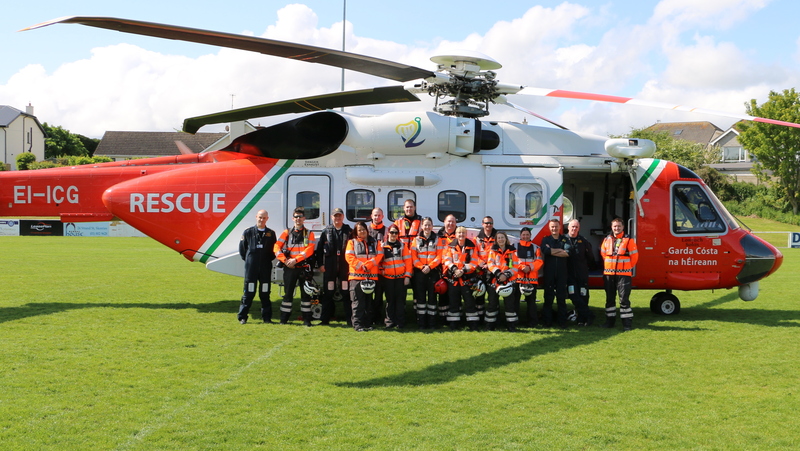 The Skerries team were joined by their fellow Coast Guards from Clogherhead. Shortly before 09:30, the helicopter made radio contact with the Coast Guard ground team to confirm its imminent arrival. Orange smoke flares were deployed at the site, to assist the helicopter crew with assessing wind speed & direction. 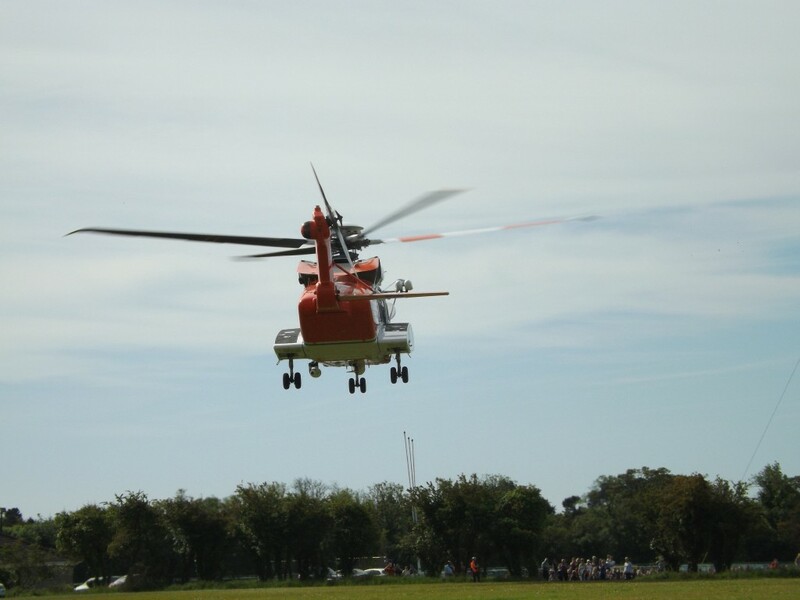 The Sikorsky helicopter landed on several moments later, the first time a Coast Guard helicopter had ever landed at the immaculate grasslands of the cricket club site. 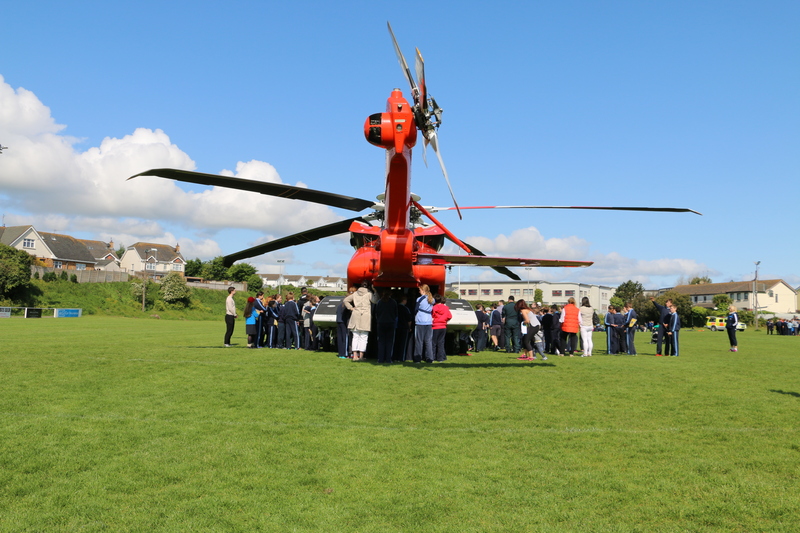 The purpose of the visit was to allow the excited pupils of the nearby Scoil Moibhi National School an opportunity to explore the impressive helicopter up close and learn more about the work of the Coast Guard. The Coast Guard extends its sincere thanks to all at the Hills Cricket Club for allowing us the use of their club lands for the visit. This morning, members of the Skerries Coast Guard team were out at the Portrane/Donabate peninsula for a landing of the Coast Guard’s Dublin based Sikorsky S92 helicopter (Rescue 116). 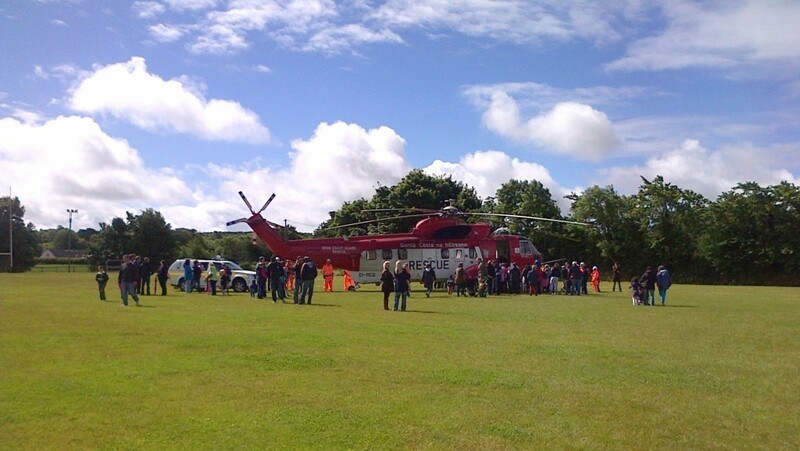 The helicopter landing was eagerly awaited by a large crowd of 450 primary pupils of Donabate’s Scoil Phadraic Cailini. 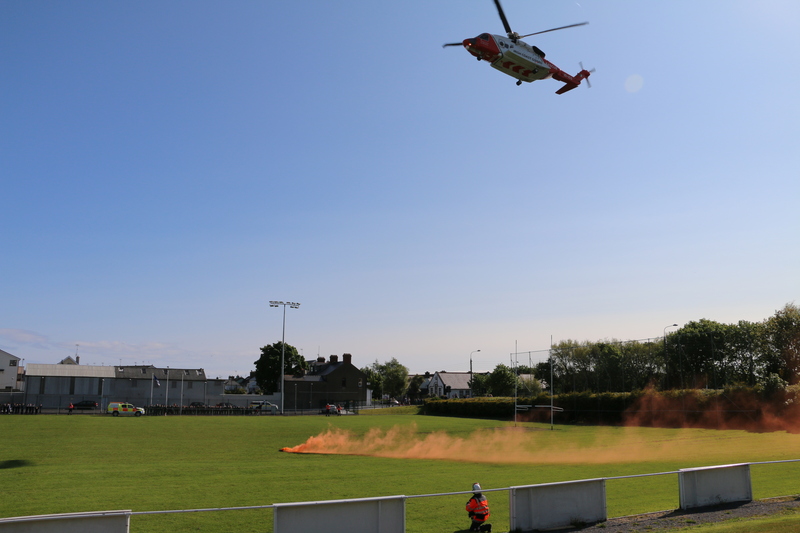 The Skerries team prepared the landing site for the helicopter at Donabate’s St Pats GAA Club. Orange smoke flares were deployed to assist with wind speed/direction indication for the helicopter crew. After a couple of circuits, the helicopter landed down safely at Donabate shortly after 09:30. Once shutdown was complete, each class of pupils along with their teacher were provided with an enjoyable and informative tour of the impressive Coast Gaurd helicopter by a member of the flight crew. Included in these talks was also important advice on water safety, particularly vital as we approach the summer holidays. 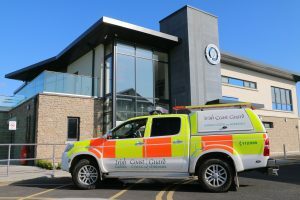 After almost 1.5 hours on scene at Donabate, the visit concluded and the Coast Guard helicopter departed back to its nearby base at Dublin Airport. Skerries Coast Guard would like to sincerely thank the Principal of the school at Donabate, Margaret O’Neill, for her assistance in organising this Coast Guard visit to the school. 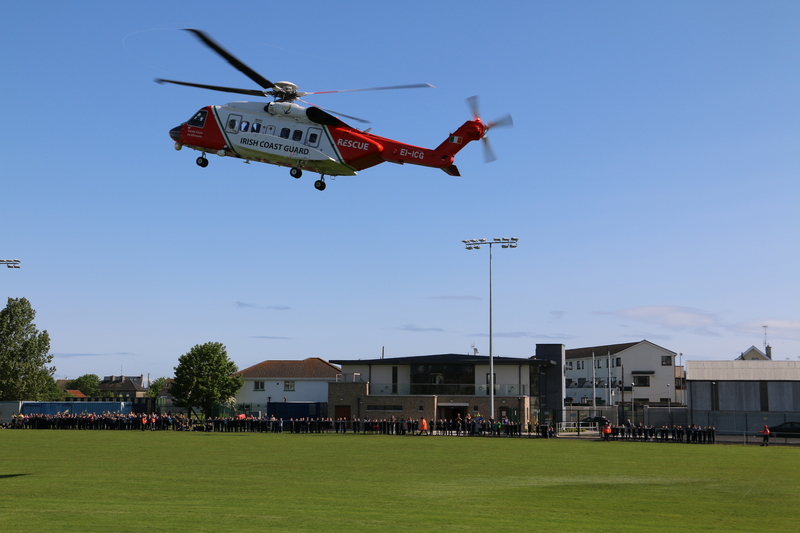 This helicopter visit is one of the many water safety awareness talks and events organised by Skerries Coast Guard each year with local schools in our operational area from Laytown to Malahide. For more information on these water safety visits, take a look at our Water Safety page. More photos of the visit will shortly be available in our online gallery. 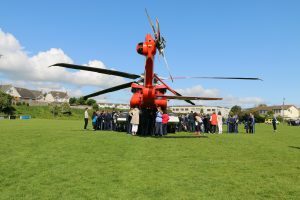 There was great excitment in the air as over 150 local national school pupls eagerly awaited the arrival of the Coast Guard’s Sikorsky S61 helicopter to The Clann Mhuire GFC, Naul village. Children and parents had the opportunity to have a look around the helicopter and learn about the search & rescue work of the Coast Guard. The Balbriggan Fire Brigade crew also attened the landing and took part in a training briefing on helicopter operations. The Coast Guard’s Sikorsky S61 helicopter has played a vital role in numerous rescues in the local area in recent time, most recently at Balbirggan harbour earlier this week. Many thanks for Balbriggan DFB for taking part in the exercise. More photos of the exercise are available in our online gallery.